SkyTeam Airline Alliance Management Coöperatie U.A. (“SkyTeam”) is aware that the privacy and data security of customers using SkyTeam services available on its website, mobile site and other mobile applications is important. SkyTeam is therefore protecting their personal data with the greatest possible care, committing to complying with the requirements of applicable data protection law. All data collected to provide you with our services is in particular being processed in accordance with the Dutch Personal Data Protection Act. As data controller for the processing of your personal data collected through the SkyTeam website and applications, SkyTeam has notified such processing of your personal data to the Dutch Data Protection Authority (Autoriteit Persoonsgegevens) under number 1541232. This report is available to the public and can be accessed over the internet at https://www.collegebeschermingpersoonsgegevens.nl/asp/orsearch.asp. 1 What personal data do we process? 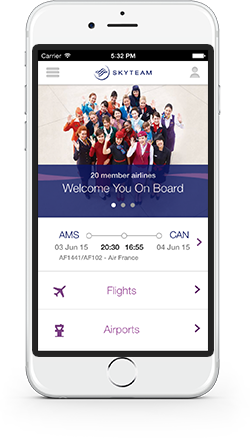 1.1 When you use the SkyTeam website, mobile site or applications, we may collect various personal data of you. These data may be provided by yourself, for example, when you register yourself on our website, or when you provide your data for a survey or competition, for purchasing any of our or our Members’ products or services or when you contact us for any other reason. Your data regarding the use of our website, mobile site or applications or generated by the use of our services may also be collected automatically. 1.2 The personal information that we may collect of you may include: identifying information like your name, title, gender and date of birth, your passport number, nationality, and country of residence, contact information like your address, (mobile) telephone number, email address, fax and pager numbers, administrative numbers like your loyalty program number, financial information like your credit/debit card details, travel-related information such as your travel company, emergency contact(s), seating preferences, specified medical needs and dietary requests, information that you provided to us about your interests and preferences, demographics, experience with SkyTeam and/or SkyTeam Member airlines’ services, and contact preferences, your corporate details, such as your job title, employer or affiliation and contract information, and your participation in events, any correspondence with you, opt-in's, opt-out's and objections, information generated by the use of our services such as online check-in, airport kiosk access and self-service devices, information about your visits to our website, such as your IP address, Internet service provider, browser type, operating system, pages accessed on our website, mobile site or applications, date and time of access, and referring website. 2 For what purposes do we collect your personal data? We primarily collect your personal data for the performance of our services, such as ticket bookings, reservation management, loyalty programs and customer services, as well as the financial settlement thereof. We may also use your data to inform you, maintain contact with you, as well as for direct marketing purposes to be able to deliver personalized offers and other services suited to your interests. Your data is furthermore used for analyzing and optimizing our website, mobile site and applications and your experience with SkyTeam online, and also to improve the quality of our services or the services of SkyTeam Member airlines. SkyTeam may anonymize your data for such analysis. Your personal data may also be required for our internal administration, accountancy audits and fulfillment of statutory obligations, such as administrative formalities required for immigration and customs, combat fraud and ensure flight safety and security. Your personal data will not be used for any purposes other than the purposes described above. 3 Who has access to your personal data? SkyTeam uses appropriate security measures to protect your personal data against unauthorized access, loss, deletion, disclosure and improper use, and to maintain the accuracy and integrity of your data. These measures are reviewed regularly. Although we use our best efforts to protect and secure your personal information, we cannot guarantee this to be 100% secure. Consequently we cannot ensure or warrant the security of any information you transmit to us or from our website. 5 How long will your personal data be retained? 6 How to exercise your rights? 6.1 If you have any query about our processing of your personal data, or if you would like to review, correct, change or delete any of your personal data processed by us, please contact us by using the contact details mentioned below. 6.2 If you have a personal account for our website, mobile site or applications you can update your user information and preferences via the relevant profile and preferences section in your account. 6.3 If you receive mailings from us, and you no longer want to, you can deregister by sending a request to deregister to that same e-mail address or by using the deregister link in the relevant mailing. 6.4 Should you have a complaint on the processing of your personal data by SkyTeam you may also lodge a complaint at the Dutch Data Protection Authority (Autoriteit Persoonsgegevens). This website may contain links to websites of other parties. Please be aware that SkyTeam is not responsible for the content or privacy practices of those websites. We encourage you to consult the privacy statements of each website that you visit.